What is drifting? Despite the incredible popularity it enjoys across the world, it’s still hard to put a firm definition on this sideways form of driving. Yes, it always involves cars sliding around some type of corner, but there are really no universal rules to describe exactly what does or does not constitute drifting. Is giving it a little extra gas and pushing the tail out in the rain drifting? What about a doing big donut? How about pulling the e-brake and waiting for the rear end to come around? 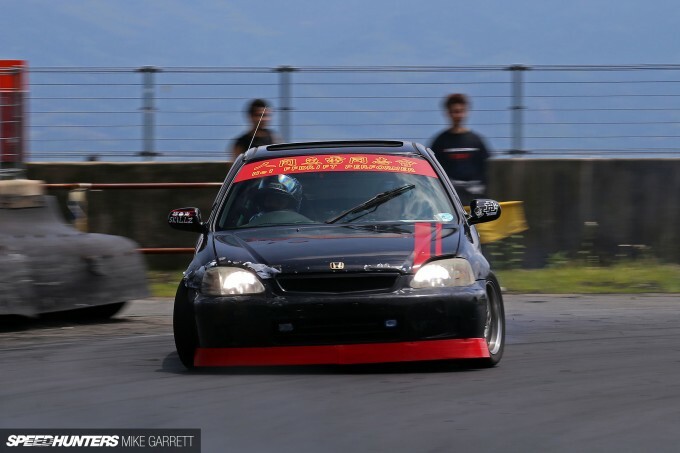 Meet Genki Hirata, a drifter from Kanagawa whose weapon of choice is not a Silvia or a Chaser, but an EK4 Honda Civic SiR. 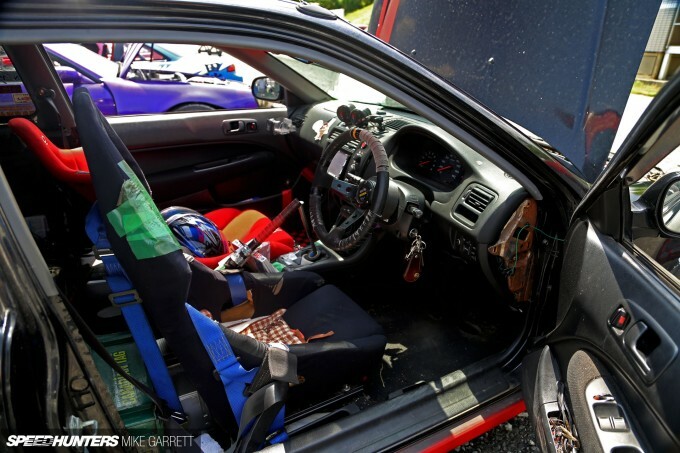 While Hirata-san isn’t the first person in Japan to drift a front-wheel drive car, he and his Civic are quite well know amongst Kanto’s drift community. It’s hard to not to chuckle when you watch Hirata-san’s Civic take to the track amongst the crowd of turbocharged rear-drive Toyotas and Nissans, but once you see him work his magic in the corners you can’t help but find yourself impressed – and wondering how the hell he does it. The car itself is battered. The rear end has been smashed down to almost nothing after countless wall rides and the interior is equally thrashed. But in spite of all that, Hirata-san still drives the Civic on the street. And while the driving style very unconventional, the Civic itself is actually quite basic in its specification. There’s definitely no trickery going on. Under the hood sits an almost-stock B16A DOHC VTEC motor, but it’s not the horsepower which makes the Civic capable of its moves. In fact, power makes little difference when trying to drift an FF car, as you aren’t actually using the drive wheels to keep the slide going. Is suspension the secret? Well it’s certainly important. Hirata-san tells me the car is running a mismatched set of coilovers, and as you might guess he keeps the rear end very stiff to help the car rotate easier. Brakes are one of the more crucial components in making a front-wheel drive car drift, and just as the suspension is setup for extra rear stiffness, the aggressive rear brake pads also help to make the EK swing around. And of course there’s the hand brake, which is going to be the most important part of making any FF car drift. Not only is this a crucial component for initiating oversteer, it’s through a balance of e-brake and throttle inputs that the car can maintain its slide. 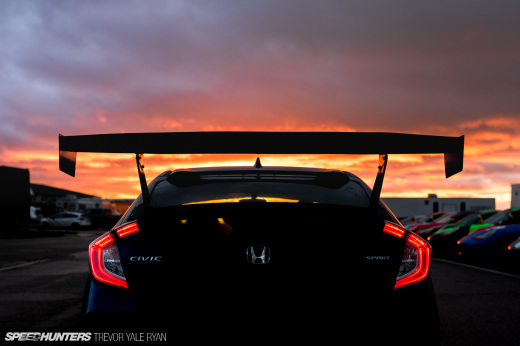 Wheel and tire choice also plays a significant role in the Civic’s setup. As you can see, Hirata-san runs wider wheels and grippy tires up front – in this case SSR mesh wheels with Federal 595 RSR rubber. And in the rear you’ll find narrower wheels with junk tires, which once again contribute to the Civic’s tail-happy nature. But more than any parts or settings on the car, Hirata-san tells me it’s about “passion.” Sure, he could drift any car he wants to, but he’s fully embraced the challenge of making his front-wheel drive Honda do something many will say is impossible. And how does the car look on the drift course? Well, that depends who you ask – but in my eyes this guy has mastered the art of sliding a front-wheel drive car. 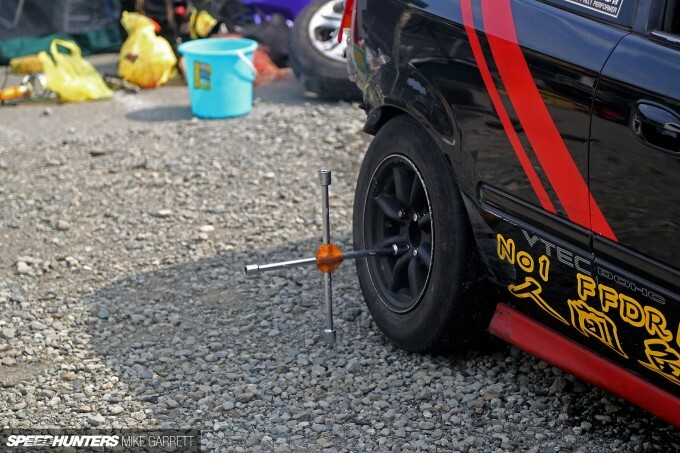 Sure, the drifting will never look the same as that of a rear-wheel drive car. The slides can’t be initiated as early, and you can’t just add more power to pull out of the corner. But in the middle of the corner the delicate balance of throttle and braking is very convincing. Here’s a quick Instagram video clip I shot. Here’s a video from Hirata-san’s YouTube channel showing him having some fun with another FF drifter last year. And some more FF shenanigans at Suzuka Twin Circuit. A drifting purist might laugh at the notion of a drifting Civic, but you can rest assured that Hirata-san doesn’t care. He’s too busy driving and smiling. 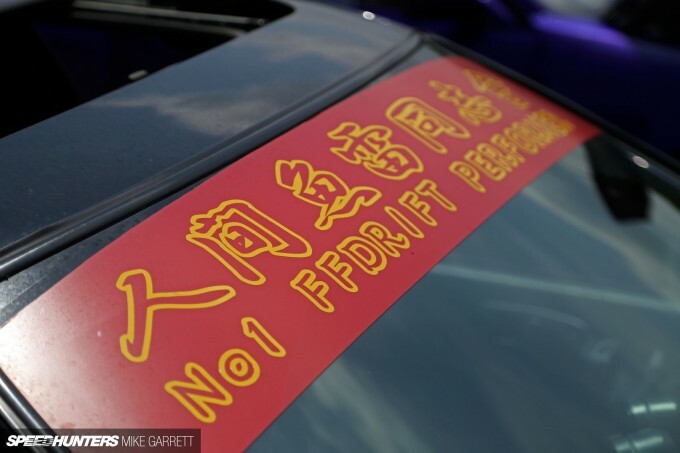 And really, who’s to say what does or doesn’t constitute drifting? The whole spirit behind the sport is about having fun and being a little rebellious. And what’s more rebellious than sliding around in a front-wheel drive Honda? Haters gonna hate, but whether it’s ‘real’ drifting or not, this guy is out there having a blast and never taking himself too seriously. You couldn't have said it better Mike! IT'S NOT WHAT YOU HAVE, IT'S HOW YOU USE IT!!!!! Yes let the haters hate but at the end of the day, this guy is having more fun than you! This might "look like" drifting for a second, but the feeling of turning with gas is the point of the whole thing..
Well, I think this is not "100 %" Drift, but hey, he is doing a great job sliding that Civic, and it seems to be a lot of fun behind the steereng wheel! This reminds me of the falken drift civic and that guy with the civic sedan on drift tengoku at sekia hills. Not drifting per se but I tend to prefer Jean Ragnotti's more humble and natural effort. My hatch would unload in corners coming in hot and pressing the clutch in, not sure I would have the balls to pull the ebrake too. 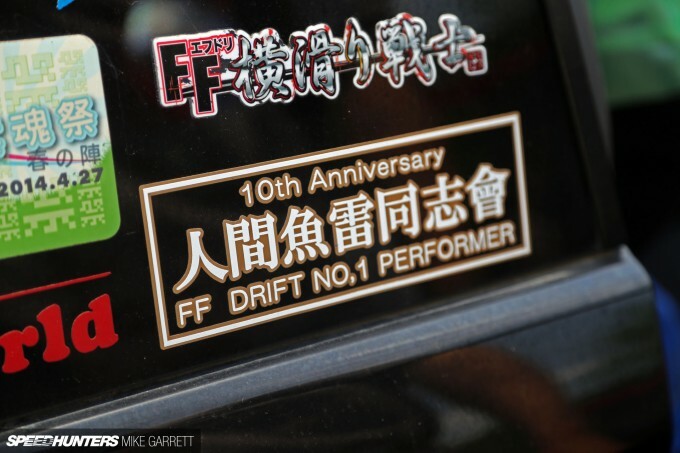 I love FF drift. Sliding the back around on a small, light FF car is hilarious fun. Awesome article! Nice change of pace from all the nissan copy cats. It looks yuck and sounds yuck to me. Guy is probably enjoying himself, more power to him. I used to slide a Hyundai Accent 2003 really hard a couple years back. I hate how i never recorded any sessions but i used to go out with buddies sliding their 40's or z33 and i was in a pos accent sliding harder than most people around my area haha. I hate when people say it can't be done in a none rwd car. Derpy grow up ..drifting is drifting. Sounds like your jist jealous u can't drive like that..if u read .well if u can read ..it says he is out having fun .fun something that ppl build cars for .maybe if u had some u would appreciate what he is doing.!! Clip and article was awesome great read!! @derpy I bet you think +60 offset w/ 195 wheels is the pinnacle of automotive modification. Twitch_6 BUT MUH STANCE! MUH CAMBER! MUH FITMENT! WHERE'S THE DAPPER! 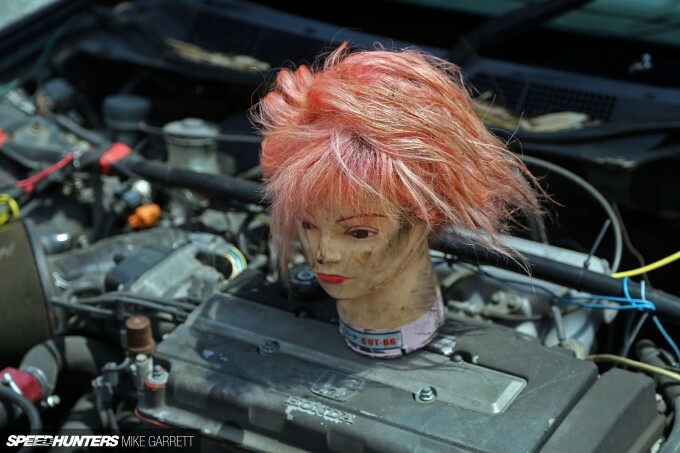 This is a form of automotive comedy, I know I can't do it because I am too much of a conformist. For that, I really appreciate what he does. 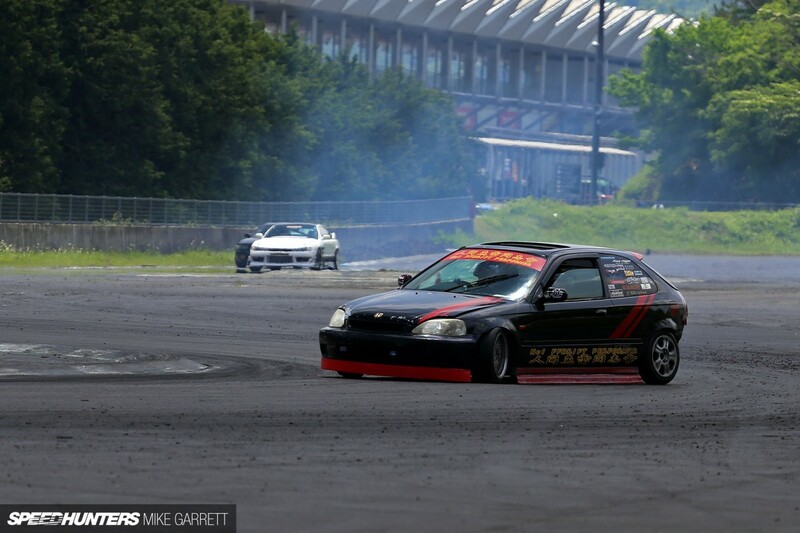 I don`t think e-brake drifting counts...but I love Honda especially civics. This just isn`t right man. Insane. That picture of him copying Spiderman whilst crouched on his engine is just nuts. The man is nuts. But then again you'd have to be to do something like this haha. Good on him though, for driving his car and being proud enough to adorn it with stickers and not have a rear bumper. Love the whole "grassroots" and low budget thing with real people who do it for fun and with no big money sponsorships. I definitely dont think it looks good, but I'm sure its a hell of a good time to watch/do, and really thats all that matters! The pinnacle certainly isn't a B series powered dishwasher with plastic trays under the rear tyres. 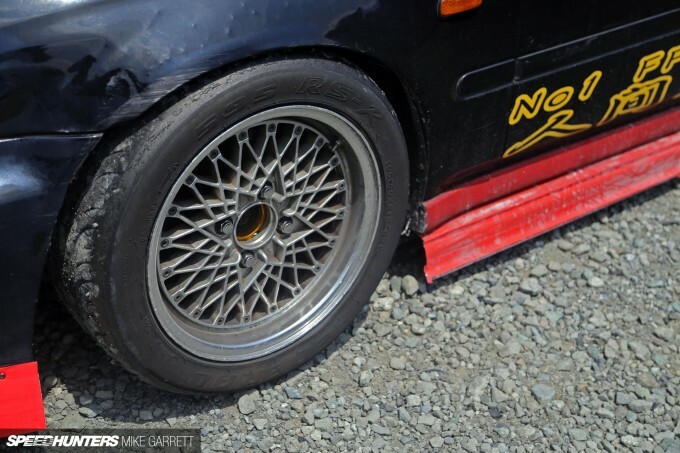 It's one thing to initiate a drift or adjust angle mid-drift by using the e-brake sparingly, but keeping the e-brake on 90% of the time while the front wheels drag the rears the whole time is another. Not really drifting, but props to him for doing what he can with what he's got and sticking with it. He's definitely perfected the FWD method. ToneDiez Looks like drifting to me. DonHoonigan how is it not?